Whether it’s a student-organized workshop or a larger international conference, students and alumni from EPOS degree programmes contribute their expert knowledge from different disciplines and regions throughout the world. This is where we report on it. According to the United Nations, seven billion people will live in cities by 2050 – twice as many as today. Ensuring that bustling metropolises remain liveable is an enormous challenge. 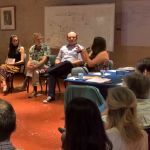 This was the topic discussed by alumni of the Development-Related Postgraduate Courses (EPOS) when they networked at a workshop in Rio de Janeiro. 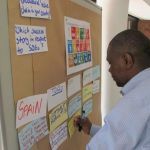 Africa as a largely under-industrialised continent was the focus of a practice-oriented, interdisciplinary workshop in Bonn: “Natural resources based rural development in Africa”. Students of the Development-Related Postgraduate Courses discussed the feasibility of their own ideas. Studying in Germany is not their only connection. 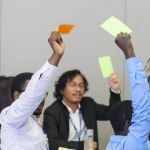 They have a question in common: “How can we succeed upon return?” This was the topic at the Network Meeting of the Development-Related Postgraduate Courses and the degree courses of the Helmut Schmidt Programme. Water, energy, food – security in these areas is crucial for every society. 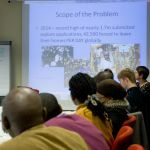 How these areas are connected was discussed by students from three development-related postgraduate courses in Bonn. Sustainability is not only important in environmental protection but also in the workplace. At the first alumni conference, international graduates of Nürtingen-Geislingen University talked about how personal happiness and economic success can be united. 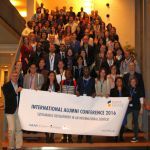 Bound by a common conviction that a world without hunger is possible, 32 DAAD alumni from Sub-Saharan Africa convened at the University of Hohenheim’s interdisciplinary Winter School to address the challenge of feeding the world. 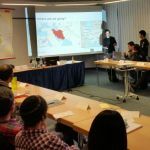 Understanding the causes of forced migration – and developing effective solutions – was the focus of the AGEP Winter School held at Otto von Guericke University Magdeburg. 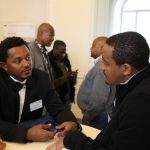 DAAD scholarship holders and alumni from Sub-Saharan Africa engaged in lively discussions, and even presented their recommendations to experts at the Federal Foreign Office in Berlin.